Probably the most wanted skin care range ever, Drunk Elephant is worth the hype – and then some... Founded by Tiffany Masterson, who wanted a clean break from toxins and the ‘Suspicious 6’ (essential oils, drying alcohols, silicones, chemical screens, fragrance/dyes and SLSs) this brand has created a whole new category in the beauty space: ‘Clean-Clinical’. 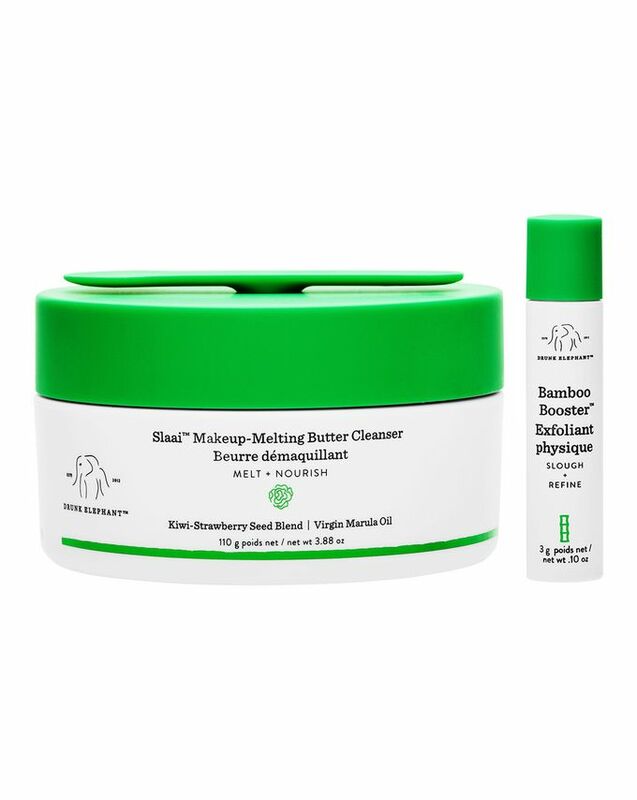 Answering the prayers of many a Drunk Elephant devotee, this brand launch unites the Slaai Makeup-Melting Butter Cleanser and physical exfoliant Bamboo Booster. An innovative oil to milk formula, Slaai effectively melts away all traces of dirt, make up and sunscreen from skin, while the Bamboo Booster helps to clear build-up for a radiant complexion. A must-try for any Drunk Elephant devotee, this brand new Slaai Makeup-Melting Butter Cleanser unites a clever oil to milk cleanser that when used on dry skin with dry hands, effectively melts away all traces of dirt, debris, make up and sunscreen – even water-resistant formulations. Free from the suspicious six, Slaai is infused with clean, anti-oxidant rich fruit extracts and oils to help soothe skin while an African oil blend of marula, baobab, Kalahari melon, mongongo and ximenia, intensely moisturises, restores elasticity and a youthful glow, softens and dissolves make up. Designed to be used on dry skin, Slaai removes excess oil, grime and make up from skin. Adding water activates Slaai into a milk that rinses cleanly, leaving behind a dewy glow. Use the accompanying Bamboo Booster – a physical exfoliant, formed from ultra-fine bamboo and charcoal spheres, once or twice a week to gently slough away build-up and dead skin cells to help reveal a dewy complexion. PM: On dry skin, use dry fingertips to massage Slaai over face and eyes. Add water to activate, rinse well with warm water and pat dry. May also be removed with a soft, damp cloth. AM: (optional) 1-2 times per week, add our Bamboo Booster to Slaai for a customised, skin-refining physical exfoliation to aid in the removal of dead skin cells that have accumulated on the surface overnight. Avoid the eye area when using the exfoliating booster. Tip: If using retinol, we recommend avoiding Bamboo Booster, or using with caution, as it can be too much for skin. I have been using this cleanser for the last week or so and I absolutely love it! Literally melts like butter and doesn't irritate the eye area at all, which makes it perfect for removing mascara! Where do I even begin? After winter stripped my skin of moisture, this cleanser literally brought it back to life! After one use only my skin felt moisturized and plump and I had no more dry patches on my skin. While moisturizing it also removed every last trace of makeup. And the magnetic spoon is just plain genius. What's not to love about this product?! i have been using FARMACY's green clean cleansing balm but bought this as it costs less for more product and essentially will be doing the same thing. first thing i noticed was that it smells like cardboard which i disliked however it did a great job at removing my makeup and left my skin feeling soft. What an amazing balm cleanser. It melts like butter and takes mascara off with no pulling. It has left my skin feeling soft and smooth without an oily residue. Plus the magnatised spoon is a fantastic idea, no more losing that in the cupboard! I would highly recommend this product. Clean, glowing skin comes easy with this. I really wanted to try a cleansing balm so gave this one a try and so far it’s been great. As others have said you only need a tiny bit so it would last you ages and I thought the price tag was very reasonable considering the brands usual pricing range. I felt like my face was properly clean as with a lot of other cleaners I feel they just sit on top of the skin, I found this one penetrates into the pores to remove that sank in make up. I especially love the little magnetic spatula which is such a clever idea if you have butter fingers like myself. Would purchase again. I have been using Drunk Elephant skincare for over one year so far, and it has been more than a pleasant experience. Each product has amazed me, and has transformed my skin in he greatest of ways. On their Instagram, I checked their story and saw the announcement of this product and I was excited. I have been using Clinique's cleansing balm for a considerably long time and loved it but I was willing to switch to something which I know will be better. And I was right! Although the scent is similar to Clinique's cleansing balm, Drunk Elephants cleansing balm is different. I noticed that it made my skin feel insanely soft after washing it off, and is still soft after following with my second cleanse. I didn't notice that with Clinique's cleansing balm. Furthermore, following up with the Protini moisturising cream, my skin felt so much more moisturised, soft and smooth compared to other days. I used it again the next day, and had the same results. I also feel like this is making my skin look better? My post-acne marks look much less red, and my skin overall looks more even... This is definitely going to become a holy grail item for me! I use the whole Drunk Elephant range after being introduced to the Littles set. This is hands down the nicest makeup remover and exfoliator ever. My skin is quenched and full of moisturise and my makeup melted off in minutes... It comes off easier using a cloth than just your hands. My foundation glides on and looks like a second skin which is a major bonus for me as I have very dry skin which sometimes makes foundation grab and look cakey. This will last ages as you only need a pea sized amount to cleanse your whole face and I love the magnetic spoon! I love all the Drunk Elephant range - actually, everything but the jelly cleanser - and I must admit after trying so many cleansers like this I did wonder what it was going to bring to the table. Well, it’s incredible. It makes my skin look like I’m wearing foundation, actually my skin looks better than when I wear many foundation - and I’m not someone blessed with naturally flawless skin. I’m not sure what ingredient has done that, but it’s wonderful. It also has made my skin feel incredible too. The only downside? It’s sooooo easy to put mucky makeup fingers in the butter to grab more and not use the little magnetic spoon, but I can’t see how this could be designed any other way, since it’s a solid that turns to a liquid/thin paste with the warmth of your hands. Would repurchase, for sure. This is probably the best cleanser I have ever used, the quality is supreme and it does the most amazing job! Only a little amount is needed to cleanse the whole face and neck. It dissolves into the skin easily and feels luxurious! I was literally amazed at how it removed every scrap of makeup on my face, not many cleansers remove everything and it normally takes a double cleanse! Mixing with water enhances the experience and the cream turns milky. I also tried the Bamboo Boost mixed in and it is a great exfoliant - I use retinoids and wouldn't use this more than once a week as it is quite a strong exfoliant but the results were lovely! My skin is soft, bright and feels so clean! DE is fast becoming a staple brand for me - another absolutely fantastic quality product! I can honestly say this is by far the best cleanser I have used, I have very sensitive skin and this balm didn’t aggravate my skin at all, it left my skin plump and so clean. You only need a tiny amount so will last a while, I can’t recommend this enough, my skin glows after using the balm, very impressed! I absolutely love this product! I used it twice and only received it yesterday. My face felt squeaky clean after 1 use. My makeup slids off my face, definitely the best makeup cleanser I have used and at a fantastic price too. This will last ages as a little really does go along way. I love the magnetic spoon! Absolutely love this new cleanser. A little bit goes a really long way, after one application, it pretty much removed all my make including my mascara! It leaves the skin feeling hydrated and radiant, I also occasionally get redness after cleansing but with this my skin looks smooth and even! The cleanser doesn’t really have a smell, just very none offensive but neither pleasant which doesn’t really bother me. The Bamboo Booster is such a clever little add on and feels lovely on the skin! The packaging is a bonus, it’s so cute! I can’t bring myself to throw the box away so I’m just keeping the cleanser it in for now. Also another perk is that the spatula has a magnet on which is magnetic to the lid, such a clever idea so that you don’t lose it. All together I was super impressed, it’s an amazing cleanser for removing makeup, super gentle and all the little extras just make it even better. I would definitely purchase this again and would 100% recommend this! This is a really lovely unscented balm cleanser that easily melts into an oil. It easily removes all my makeup (but I haven’t tried waterproof mascara) and is a great first cleanse. It leaves no residue on the skin after and doesn’t make my skin feel tight at all. Really great value. I’ve only used this twice, but it only arrived yesterday! Wow wow wow, I didn’t think anything could convert me from my holy grail first cleanse product.... but this is most definitely the beginning of a beautiful friendship.